Touchstone Speaker Simeilia Hodge Dallaway speaks at the Statera conference in Milwaukee. Published Oct. 14, 2018 at 6:56 p.m. 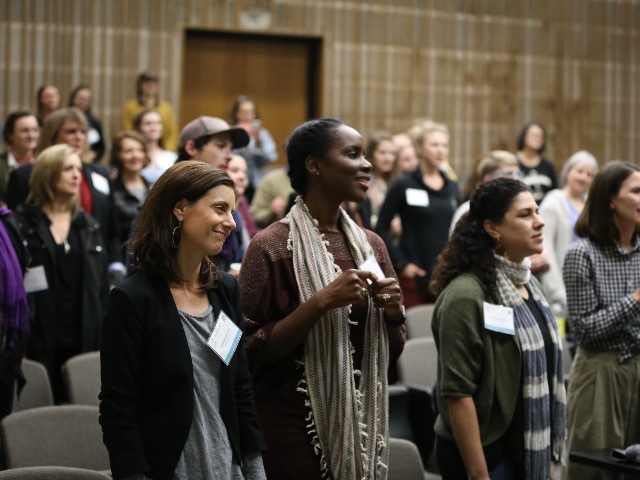 In 2016, the Wellesley Centers for Women partnered with American Conservatory Theater to study gender equity in leadership opportunities in hundreds of nonprofit American theater companies. Their findings concluded that women have never held more than 27 percent of leadership positions. The League of Professional Theatre Women released a similar study assessing female representation in regional theater. The report, "Women Count: Women Hired Off-Broadway," was based on nearly 700 productions from 2010 to 2017. It found that women were underrepresented in all areas, except for costume design and stage management. According to a survey by American Theatre magazine, just 21 percent of plays presented by regional theater companies in the 2015-16 season had female authors. In the magazine's 2017 survey, they reported that number of plays produced by women playwrights had increased to 26 percent. But the Statera Foundation is trying to change all that. Statera, which means "balance" in Latin, is an organization founded to actively work towards gender parity in the arts. They work on behalf of women in theater and other arts fields to expand employment options, improve salaries and remove barriers to growth and achievement through mentorship, research, engagement, education, networking and support. On a rainy day last week in Milwaukee, nearly 200 participants gathered on the UW-Milwaukee campus for the third national Statera Theater Conference. Hosted by the local non-profit organization Renaissance TheaterWorks, the three-day meeting, Oct. 4-7, offered individual artists, arts administrators, academics and students the opportunity to discuss both the accomplishments and challenges for women working in theater and other arts fields. Conference planners scheduled speakers, networking opportunities, panels and performances to uplift, amplify and advance women as they work towards full and equal participation in the arts. "First, we want to celebrate all the work that's happening to advance our cause," said Shelly Gaza, co-founder of the Statera Foundation. "And then we want to create a space for women arts professionals to connect and strengthen our social networks. It's really exhausting working in your own little silo, so we want to create community." Executive Director Melinda Pfundstein added, "We also want to provide clear pathways to leadership. It's projected that there will be a great deal of turnover in leadership positions within the LORT (League of Resident Theaters) system in the next few years, so advocacy for women to fill those roles is more important than ever right now." Towards that end, at the conference, Statera announced the establishment of a new mentorship program that will help develop female leaders in arts organizations. "Another real benefit of being together in one room like this is the energy," Pfundstein continued. "We want to inspire women in the performing arts to take that energy and drive back to their own communities and continue to work for gender parity in their own communities." In the opening remarks for the conference, RTW Artistic Director Suzan Fete spoke glowingly of her previous experience with the Statera Foundation. She attended their 2016 conference in Denver along with Milwaukee actress and director Laura Gordon – although Fete was somewhat reluctant at first. "Honestly if I hadn't promised Laura I was going, I would probably have bailed," she confessed. "We were in the middle of rehearsal for a show, and there was a lot going on at the office. But I am so glad I went! The presenters were experts in their respective fields. They were generous and gracious with their time and knowledge. I attended a presentation on practical tips for new play development that completely changed RTW's template for our Br!NK new play festival. And throughout the conference the message of support and camaraderie was pervasive." As that conference concluded, Fete was inspired and invigorated to continue the work of RTW, the only Milwaukee theater that has a commitment to promoting the work of women, both onstage and off, as part of its mission. "The overall feeling I got from the conference was excited hopefulness ... the belief that together we can accomplish anything. Not only did I gain professional knowledge that I was able to bring back to RTW in order to improve our company, I made several important connections with like-minded women committed to improving gender parity in theater." In fact, Fete was so excited, she approached conference organizers on the spot and volunteered to host the next national gathering in Milwaukee. The result is the 2018 Statera Conference, offering the largest number of panels for the largest number of attendees to date. Discussion topics for this year's conference included new play development, multiculturalism and social justice in theater, creating a feminist community in the rehearsal room, presenting cross gender characters in Shakespeare, creating devised theater, directing from a female perspective, queering the musical theater stage and the importance of solo performance for women in theater, among many others. When asked if she sees forward progress on Statera's goals, Pfundstein says, "Yes absolutely. The #MeToo movement has helped bring issues of inequality and marginalization into focus. But generally I find people are so hungry to do this work. Leaders whose organizations are flawed, or not yet up to speed, are hungry to have these conversations. Individual women are becoming more empowered in their own right – using their voices and taking up space." Beginning this fall, Statera is changing its name to StateraArts to be more inclusive of all women in the performing and visual arts fields. For the first time, the organization is also offering memberships. 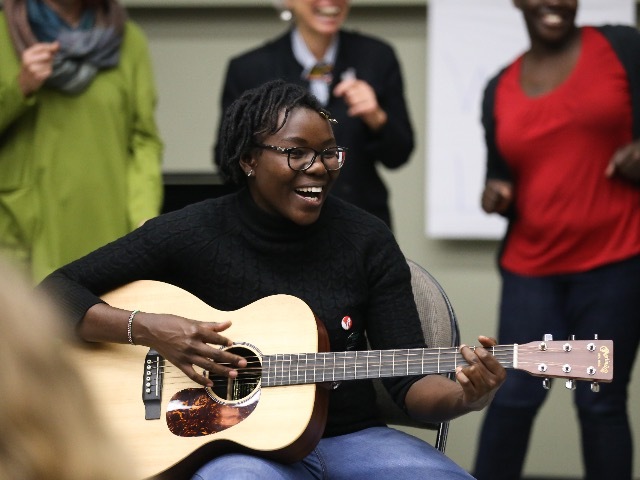 For a small fee, anyone interested in fostering gender parity can join in the organization's efforts and become connected to like-minded arts practitioners across the country. "Getting together, learning from one another, our conferences are typically a soul-nourishing experience," said Pfundstein. "There is joy in every step of the work." Fete concurred, saying, "My hope is that the conference will inspire all the attendees, and we will all return to our theatrical homes fortified and passionate about celebrating women's roles in the arts."